'Easel Paintings' covers a wide range of media from pencil and pastel drawings to acrylic, oil, and mixed media paintings. 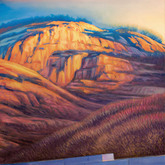 Easel paintings tend to be much more intimate in scale and therefore more personal than murals and environmental works. ​"For a painter in our 'modern' era, this is a very challenging and liberating time to be an artist. The freedom of expression and the choice of media and style is literally unlimited. My goal, in the midst of the chaos and confusion of the contemporary art culture, is to create beautiful images that are intellectually stimulating and expressively creative.